Ayegbeni Yakubu scored a hat-trick but could not help 10-man Leicester to a win against Middlesbrough. The Foxes took the lead with a Yakubu tap-in before Marvin Emnes equalised from Richard Smallwood's pass. Yakubu poked in and then grabbed his third from 12 yards before a volley from Rhys Williams reduced the deficit. Julio Arca had a penalty saved after a handball by Jeffrey Bruma, who was sent off, but Boro did make it 3-3 thanks to Stephen McManus's injury-time header. Leicester made a good start and created their first chance after two minutes when debutant Diomansy Kamara headed over from 10 yards. Yakubu then put them ahead by tapping in Richie Wellens' right-wing cross. Boro equalised when Smallwood robbed Matt Oakley, after a poor pass by Patrick Van Aanholt, and set up Emnes to finish from 12 yards. Yakubu also had an effort cleared by Andrew Davies before restoring City's lead in the third minute of first half injury-time after Bruma headed Paul Gallagher's corner back across goal. And he completed his hat-trick four minutes after the break by beating Paul Smith from 12 yards following Darius Vassell's pass. Williams replied by flicking the ball up and volleying home from 25 yards before substitute Merouane Zemmama came close to equalising with a 30-yard free-kick that hit the post. Boro had another chance to level, this time from the penalty spot after handball by Bruma, who was sent off after Chris Weale saved Julio Arca's effort. Emnes then hit the upright and it looked like Tony Mowbray's side would leave their home ground pointless before McManus headed home Tony McMahon's corner. 90:00+6:55 The referee ends the match. 90:00+6:12 Kyle Naughton challenges Joe Bennett unfairly and gives away a free kick. Free kick crossed right-footed by Tony McMahon. 90:00+6:12 Booking Kyle Naughton booked for unsporting behaviour. 90:00+3:24 Corner taken by Tony McMahon from the right by-line, Tony McMahon provided the assist for the goal. 90:00+3:24 GOAL - Stephen McManus:Middlesbrough 3 - 3 Leicester Stephen McManus finds the net with a goal from close in to the top left corner of the goal. Middlesbrough 3-3 Leicester. 90:00+2:46 The ball is crossed by Marvin Emnes. 90:00+1:45 Corner taken right-footed by Tony McMahon, clearance made by Souleymane Bamba. 90:00+1:05 The official flags Tony McMahon offside. Richie Wellens takes the indirect free kick. 89:32 Effort from close in by Marvin Emnes strikes the post. 88:39 Marvin Emnes fouled by Angelo Miguel Vitor, the ref awards a free kick. Free kick taken by Joe Bennett. 87:20 Unfair challenge on Darius Vassell by Seb Hines results in a free kick. Richie Wellens restarts play with the free kick. 87:20 Substitution Diomansy Kamara leaves the field to be replaced by Martyn Waghorn. 84:16 Richie Wellens fouled by Rhys Williams, the ref awards a free kick. Free kick taken by Richie Wellens. 84:16 Booking Rhys Williams booked for unsporting behaviour. 83:18 The referee blows for offside. Scott McDonald takes the indirect free kick. 81:07 Free kick awarded for an unfair challenge on Marvin Emnes by Richie Wellens. Direct free kick taken by Rhys Williams. 81:07 Booking Richie Wellens receives a caution. 79:54 Substitution Angelo Miguel Vitor joins the action as a substitute, replacing Ayegbeni Yakubu. 79:11 Kyle Naughton crosses the ball, Seb Hines makes a clearance. 76:54 Matt Oakley is penalised for handball and concedes a . Outswinging corner taken from the right by-line by Tony McMahon. 76:54 Sent off Jeffrey Bruma shown a red card. 75:29 Penalty taken by Julio Arca is saved by Chris Weale. Middlesbrough 2-3 Leicester. 73:33 Corner taken by Tony McMahon from the left by-line, Souleymane Bamba makes a clearance. Correction - 70:16 Substitution Tarmo Kink comes on in place of Andrew Taylor. Correction - 70:16 Substitution Andrew Davies leaves the field to be replaced by Stephen McManus. Correction - 70:16 Substitution Yuki Abe is brought on as a substitute for Paul Gallagher. 70:16 Substitution (Middlesbrough) makes a substitution, with Tarmo Kink coming on for Andrew Taylor. 70:16 Substitution Andrew Davies goes off and Stephen McManus comes on. 70:16 Substitution Paul Gallagher leaves the field to be replaced by Yuki Abe. 69:41 A cross is delivered by Paul Gallagher, clearance made by Andrew Davies. 69:06 Corner taken by Paul Gallagher from the right by-line. 68:54 Darius Vassell delivers the ball, blocked by Joe Bennett. 66:54 Free kick awarded for a foul by Paul Gallagher on Julio Arca. Paul Smith restarts play with the free kick. 64:44 Free kick awarded for an unfair challenge on Rhys Williams by Matt Oakley. Merouane Zemmama produces a shot on goal direct from the free kick. 64:37 Tony McMahon sends in a cross, clearance made by Matt Oakley. 63:03 Effort on goal by Paul Gallagher from 25 yards. Save by Paul Smith. 62:22 Patrick Van Aanholt delivers the ball. 59:59 Patrick Van Aanholt produces a left-footed shot from just outside the box that misses to the right of the target. 59:13 Substitution Merouane Zemmama joins the action as a substitute, replacing Richard Smallwood. 59:02 Effort from just outside the area by Richie Wellens goes over the bar. 58:23 Paul Gallagher takes a shot. Paul Smith makes a save. Outswinging corner taken from the right by-line by Paul Gallagher, clearance by Rhys Williams. 57:40 The assistant referee signals for offside against Paul Gallagher. Indirect free kick taken by Paul Smith. 57:19 Free kick awarded for an unfair challenge on Patrick Van Aanholt by Julio Arca. Patrick Van Aanholt takes the free kick. 56:49 Free kick awarded for an unfair challenge on Tony McMahon by Diomansy Kamara. Paul Smith takes the direct free kick. 54:34 Julio Arca provided the assist for the goal. 54:34 GOAL - Rhys Williams:Middlesbrough 2 - 3 Leicester A goal is scored by Rhys Williams from deep inside the penalty box to the bottom left corner of the goal. Middlesbrough 2-3 Leicester. 52:31 The referee blows for offside against Andrew Taylor. Indirect free kick taken by Chris Weale. 51:44 The ball is swung over by Julio Arca, Marvin Emnes takes a shot from 12 yards. 50:52 Corner taken right-footed by Tony McMahon. 48:04 GOAL - Ayegbeni Yakubu:Middlesbrough 1 - 3 Leicester Ayegbeni Yakubu gets on the score sheet with a goal from inside the area to the bottom right corner of the goal. Middlesbrough 1-3 Leicester. 45:51 A cross is delivered by Darius Vassell, clearance made by Andrew Davies. Diomansy Kamara takes a shot. Save by Paul Smith. Effort on goal by Richie Wellens from deep inside the area goes harmlessly over the bar. 45:00+4:22 It is the end of the first-half. Correction - 45:00+3:39 Outswinging corner taken right-footed by Paul Gallagher from the right by-line to the near post. Jeffrey Bruma provided the assist for the goal. 45:00+3:39 Corner taken by Paul Gallagher played to the near post. Assist by Diomansy Kamara. 45:00+3:39 Booking Booking for Diomansy Kamara for dissent. 45:00+2:31 GOAL - Ayegbeni Yakubu:Middlesbrough 1 - 2 Leicester Ayegbeni Yakubu finds the net with a goal from inside the six-yard box to the bottom right corner of the goal. Middlesbrough 1-2 Leicester. 44:47 Effort from long distance by Marvin Emnes goes wide right of the goal. 41:36 Darius Vassell concedes a free kick for a foul on Joe Bennett. Free kick taken by Tony McMahon. 41:36 Booking Darius Vassell booked. 39:02 Richie Wellens fouled by Tony McMahon, the ref awards a free kick. Direct free kick taken by Patrick Van Aanholt. 34:56 Unfair challenge on Marvin Emnes by Jeffrey Bruma results in a free kick. Tony McMahon has an effort direct from the free kick. 34:56 Booking Jeffrey Bruma is cautioned by the ref for dissent. 33:43 The ball is swung over by Richard Smallwood, Effort on goal by Scott McDonald from deep inside the penalty area misses to the right of the target. 32:45 Scott McDonald takes a shot. Chris Weale makes a save. 31:57 Richie Wellens has an effort at goal from outside the penalty box missing to the wide right of the target. 31:15 Andrew Taylor produces a cross, Scott McDonald produces a drilled right-footed shot from deep inside the penalty box which goes wide of the left-hand upright. 30:03 The assistant referee flags for offside against Scott McDonald. Souleymane Bamba takes the indirect free kick. 27:52 Shot from 12 yards by Patrick Van Aanholt. Save by Chris Weale. Corner taken right-footed by Paul Gallagher, Jeffrey Bruma takes a shot. Save by Paul Smith. 26:39 Foul by Ayegbeni Yakubu on Seb Hines, free kick awarded. Direct free kick taken by Andrew Davies. 26:39 Booking Ayegbeni Yakubu receives a caution. 23:24 Scott McDonald concedes a free kick for a foul on Souleymane Bamba. Souleymane Bamba takes the free kick. 19:44 Foul by Ayegbeni Yakubu on Andrew Davies, free kick awarded. Direct free kick taken by Seb Hines. 16:36 Corner taken by Tony McMahon, Patrick Van Aanholt manages to make a clearance. 16:12 A cross is delivered by Patrick Van Aanholt, save by Paul Smith. 13:37 Assist on the goal came from Richard Smallwood. 13:37 GOAL - Marvin Emnes:Middlesbrough 1 - 1 Leicester A goal is scored by Marvin Emnes from inside the penalty box to the bottom left corner of the goal. Middlesbrough 1-1 Leicester. 10:29 The offside flag is raised against Darius Vassell. Paul Smith takes the indirect free kick. 8:53 Free kick awarded for an unfair challenge on Tony McMahon by Ayegbeni Yakubu. Andrew Davies takes the direct free kick. 4:43 Free kick awarded for a foul by Julio Arca on Patrick Van Aanholt. Paul Gallagher crosses the ball from the free kick right-footed from left wing. Assist on the goal came from Richie Wellens. 4:43 GOAL - Ayegbeni Yakubu:Middlesbrough 0 - 1 Leicester Ayegbeni Yakubu finds the back of the net with a goal from inside the six-yard box high into the middle of the goal. 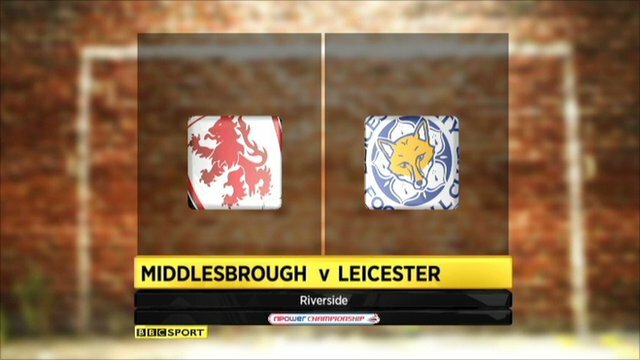 Middlesbrough 0-1 Leicester. 1:06 Header from close range by Diomansy Kamara misses to the right of the goal. 0:54 Ayegbeni Yakubu crosses the ball, Seb Hines makes a clearance.